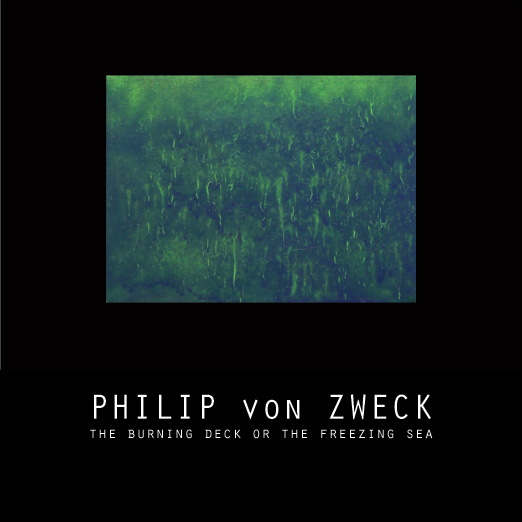 INVISIBLE-EXPORTS is pleased to present the burning deck or the freezing sea, an exhibition of new work by Philip von Zweck (featuring Thornberry). For close to twenty years, Philip von Zweck’s diverse body of work (which includes painting, performance, sound and radio works, and participatory social projects) has balanced a deep-rooted desire to create objects with a distinct set of meta-concerns. He explores ideas such as the role and function of art, who art is intended for, the efficiency of art as a means for social and political change, where does someone get off making a painting, and so on; in all likelihood brought on by too much theory at an early age. Von Zweck’s paintings begin as either portraits or texts, the subjects of which obliquely point back to the questions of faith and critical distance. One such example is Charles Fort, a researcher who compiled historical books of recorded phenomena and events, all of which stretch beyond scientific explanation. Another subject of von Zweck’s, Elphias Levi, was a 19th century occultist who wrote The History of Magic, and also O.C. Marsh, the highly polarizing paleontologist who claimed to discover the Brontosaurus, but which was, in fact, a compilation of two different dinosaur skeletons. The appropriated texts, similarly, reference a more abstracted futility, as well as notions of the impossible. Some of the paintings presented here (predominantly due to technical missteps) are liberated from their representational beginnings, worked on until they come to a state of (possibly) indefensible completion. They are not pictures of ideas, but paintings in and of themselves, having achieved something like a resolution, outside of the subject/object relationship. Also featured in conjunction with the paintings are three doorstops by Thornberry, producer of the World’s Finest Doorstops. Thornberry was founded in 2009 by von Zweck, Bridgette Buckley (furniture designer and V.P. of Design), and Kevin Jennings (sculptor and V.P. of Innovation). The Thornberry family now includes Director of Visual Communications, John Kannenberg. Philip von Zweck lives and works in Chicago, IL. Solo projects and exhibitions include Performa11/ INVISIBLE-EXPORTS; The Museum of Contemporary Art, Chicago; 65GRAND; three-walls; The Storefront; Gallery 400; Medicine Cabinet (all Chicago). From 1995-2010 he was the host of the weekly sound art radio program Something Else (WLUW, FM Chicago) and from 2003-2006 was co-founder/executive producer of the radio art collective Blind Spot. With Anthony Elms he co-curated the exhibitions “Can Bigfoot Get You a Beer” Alagon Gallery, Chicago and “A Unicorn Basking in the Light of Two Glowing Suns” DeVos Museum, Marquette, Michigan. Artist as Double-Agent an article co-authored with Zachery Cahill will appear in the Summer issue of Afterall. He currently serves as the President of Thornberry, producer of the world’s finest doorstops.